As the freelance economy grows, increasing numbers of Australians are shunning the traditional office environment in favour of shared work spaces that offer the facilities of an office with fewer overheads. For enterprising retail landlords, offering co-working spaces is a great way to diversify—and attract potential shoppers. Retail landlord Mirvac is tapping into this trend with The Third Space, a shared work hub at its Broadway Sydney shopping centre. The 100-square-metre space includes an open plan workspace, work pods, meeting spaces, and traditional office services. A dedicated concierge is on hand to collect users’ dry cleaning or pick up groceries, and visitors can also pre-order food from the centre’s food outlets. The Third Space will run for three months with all services initially free of charge. After the test period Mirvac’s innovation team, Hatch will assess how valuable the space has been. According to Mirvac, the Hatch team is tasked with creating value for customers by identifying problems and creating innovative experiences to solve them. This includes the launch of Shopping Nanny, a complimentary service that gives customers the option to book a nanny to accompany them while they shop. 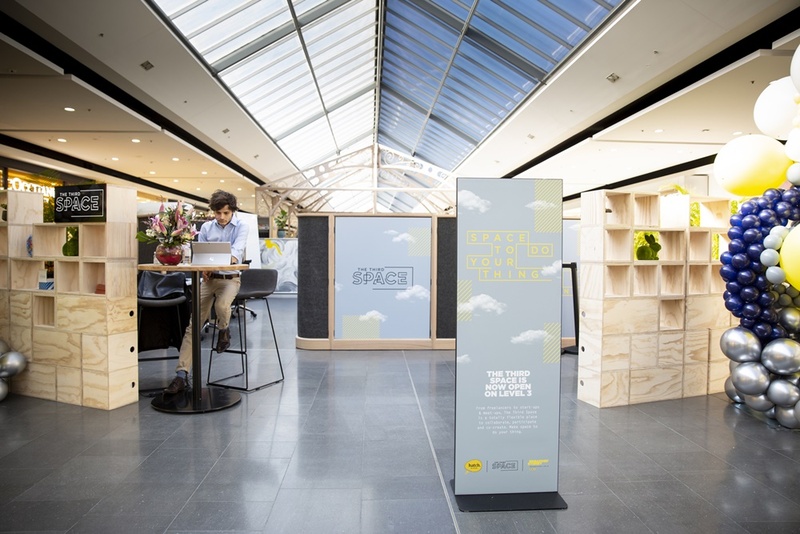 The Third Space project grew from the idea that the modern mobile worker wants the trappings of an office in an environment where they have retail at their fingertips. Broadway was chosen as the pilot location so users can be within three minutes of everything—grocery shopping, retail, restaurants, a work space, and entertainment. Mirvac head of retail Susan MacDonald said she believes The Third Space concept is at the cutting edge of retail now, but that demand for co-working spaces within retail centres will grow. “We are very lucky to work in an industry where we have the opportunity to meaningfully impact and contribute to our customers’ lives,” she said. “We’re building their homes and their shopping centres, their workplace, and we’re creating urban environments for people to dwell and live their lives. Scentre Group also sees a future for shared work spaces within its centres. Earlier this year co-working hub operator WOTSO opened a location at Westfield Chermside in Queensland offering open plan workspace and offices on flexible terms. Scentre CEO Peter Allen told The Australian Financial Review the inclusion of the hub at Chermside was part of a vision to create “living centres” rather than just malls. “It’s the start of many. What we are looking at is when we do future expansions and redevelopments we can include that type of use,” he said. 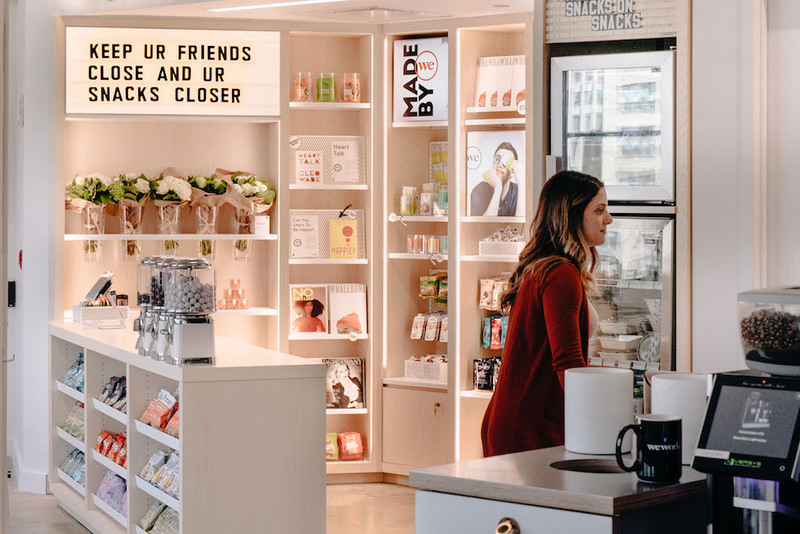 Proving the combination of retail and shared work spaces is a growing trend, office sharing giant WeWork has created its first store, WeMrkt. The small shop at its Hudson Street, New York location will sell clothing, office supplies, and snacks and drinks. The products featured were chosen in a pitch competition in April and competitions for new products will be held quarterly. In a statement, WeWork said many of the featured companies are online, direct-to-consumer brands that will have the opportunity to sell in a bricks-and-mortar environment for the first time. 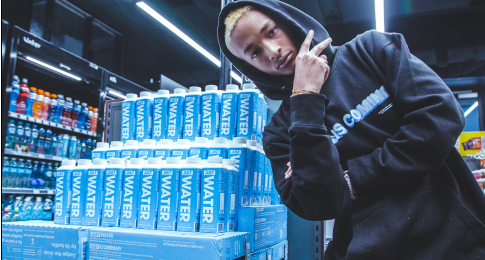 Chief brand officer Julie Rice said the store is “by our members for our members”.